For Mom and For Everone! Every time I get in the saddle I think of my Mom, Janice Lamm. My hero, my mentor, my supporter, my best friend, and my inspiration. In October of 2012 she was diagnosed with a rare form of aggressive Leukemia. In the coming months she battled physically and mentally against a brutal disease. She spent a lot of time in the care of the staff at the Dana Farber Cancer Institute. Their efforts were seen every day. It's hard to put into words the enormity of their efforts, compassion and drive to save a life. In the end, she passed away on December 29th, 2013. While she may have lost the physical battle to cancer. Her soul and spirit won. It is from her courage that I find my inspiration to ride in this years Pan-Mass Challenge. It is vital to humanity that we eradicate this disease. Not only to save lives, but to save others the grief, sorrow, and heart ache that can comes with cancer. For it is a truly a battle that shakes us at our very core. This year I ride for another person dear to my heart; my father in law, Paul DeNapoli. A truly great man with an enourmous heart. Paul lost his physical battle with cancer in November of 2017. Paul embodied the spirit of a volunteer, he would give a stranger the shirt off his back. I will miss Paul very much. For him and his spirit, we ride. We are embarking on our 4th PMC together. Without your tireless efforts and support, none of this will have been possible. Cancer effects everyone, it's everyone fight. We must all work together to beat this disease. This years financial goal is modest as I do not have an required minimum to riase. 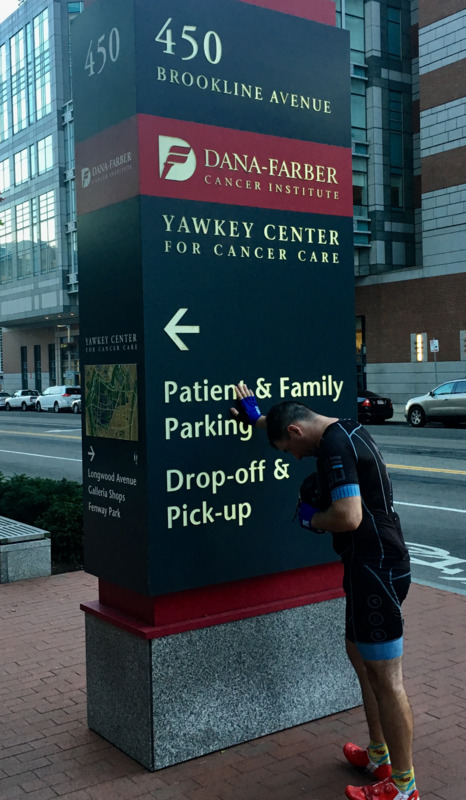 The RIDE is hard, the CHALLENGE is great, and the CANCER has to end. Let us all ride in our hearts and help those who need it most. Every mile, pedal stroke, and dollar brings us a little bit closer to finding a cure. Join me and the hundreds of others in donating to the Dana Farber Cancer Institute. Help save humanity. It could be you, your family, or your dearest friends. Not one dollar is a waste.